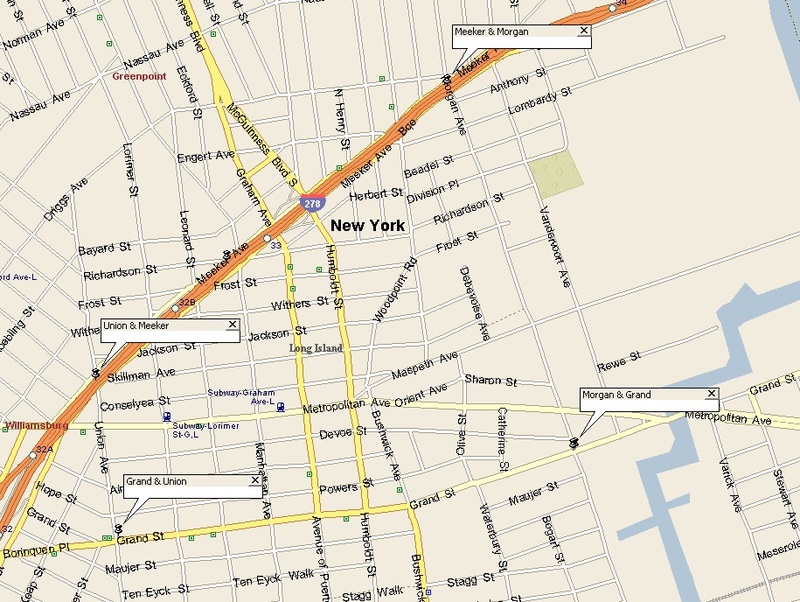 Hailing from the Williamsburg area of Brooklyn, the Jackson Gents’ turf was roughly within the four corners of Grand St., Union Ave, Meeker Ave and Morgan Ave. Jackson Street was around the middle of this, see map below, click to enlarge. The Gents were well-known both to police and other gangs from Williamsburg, getting into fights, sometimes resulting in serious injuries. In fact, in 1960, a Jackson Gent was knifed twice in the back and despite being rushed to St. Catherine’s Hospital, he died from his injuries. RUMBLE AVERTED: This was the scene when Greenpoint police, tipped off about an “intended rumble” between two teen gangs last Thursday rounded up 13 teenagers in Cooper Park at Maspeth and Morgan avenues. After giving them a close going over, the cops let the youths go with a strict warning that they would be watched. No weapons were found, the police said. But there is more to the story than this picture and caption lets on. No gang names are given in the caption, but it was between the Zeniths, another Italian gang from Williamsburg and of course the Jackson Gents. The Zeniths were from the North Side and had a club on Union Ave. Although the photo is a decent panoramic shot, there were other Jackson Gents lined up against the fence further to the right who were not in the photo. Wolfman, Rocky, Doc, Crazy Junior, Z-man. To the left of Z-man are the Zeniths and to the right of Wolfman are the rest of the Jackson Gents, not on the picture. So what is the story behind the picture? The Zeniths were a tough bunch with about 20 members, some who wore blue gang jackets with “Zeniths” written in white script on the back. Obviously the tension between the Zeniths and Jackson Gents was enough for them to schedule a rumble that day, but 50 plus years later the reason for the scheduled rumble is unclear. However, despite the planning for the scheduled fight, it never actually happened. With the Zeniths and the Jackson Gents facing each other in a ready position, about 15 Blacks from the nearby Coopers Project unwittingly walked into the middle of what was about to become a battleground. Two girls were going to fight over a guy, and when they started their one-on-one attack, members of both gangs were distracted and put the fight on hold. Watching the girls fight, everyone yelled and cheered for the girl they wanted to win. The din of the shouting reached the ears of a well-meaning neighbor who called the police. The police swept in and busted up the fight before it ever happened. Even though the article said no weapons were taken, the police didn’t look hard enough. As mentioned already, it’s not visible in the picture, but to the right of Wolfman (the boy on the far right of the picture, wearing the jacket), there were other Jackson Gents. While lined up against the fence waiting to be frisked, Doc saw a knife and a pipe on the ground near him. Swiftly thinking, he kicked them to the guy on his right, who kicked it on down the line until the last guy kicked them into the bushes, hidden from the police who did not notice. 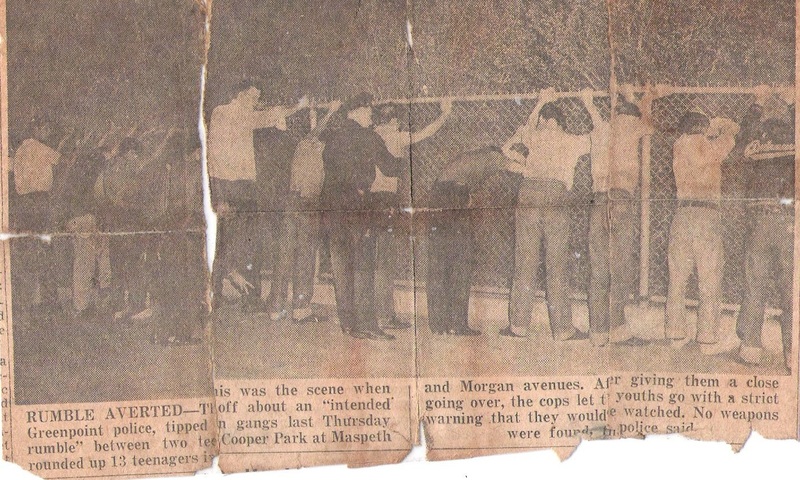 As the newspaper caption says, the two gangs were let off with a warning, but that was only the beginning. 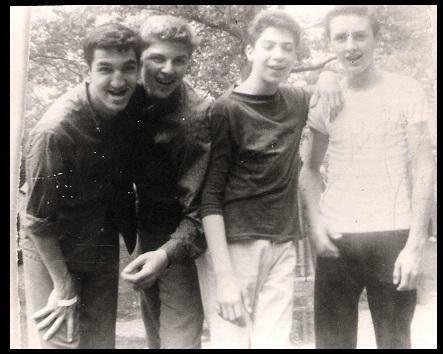 The bitterness between the Zeniths and Jackson Gents smoldered for years, into the 1960s. If you look carefully at “Wolfman,” he is wearing a gang jacket that, although difficult to see from the photo, says “Dukanes,” which was the name of the gang before “Jackson Gents” came into being. The jackets were made and purchased on Essex street and even though there was no special meaning behind the name Dukane, everyone thought it sounded cool, which was enough. However, the Dukanes caused so much trouble that anytime the cops saw them on the street they would stop and search them. The cops also forbade them from walking together. To counter this the Dukanes changed their name to the Jackson Gents and stopped wearing gang jackets. This name change made sense because a lot of the opposing gangs called them “Jackson” in the first place[ref] To be factually correct, the boys actually referred to themselves as Jackson Jents (with a J), but the papers always referred to them as the Jackson Gents. When I needed the money to buy my Dukanes jacket I told my mother that the Dukanes were a softball team. When we were busted that night and the photographer took the picture I didn’t know what paper he was from. One of the guys told me he thought that he was from the Greenpoint Star and he lived right across the street from the park. I was relieved because my father only read the NY Mirror. The next night as we were having supper my mother stood up and walked behind me. I didn’t notice that she had a newspaper rolled up in her hand. She started to hit me over the head with it, bam, bam, bam.saying “a softball team, a softball team”. It seems that although WE didn’t get the Greenpoint Star, or whatever paper it was, my aunt sure did. To this day I still laugh when I remember that. Doc actually saved his jacket as a reminder of his gang fighting days. The jacket had a knife hole in the back where a member of the Noble Aces tried to stab him. He kept his jacket for a long time, hanging up in his closet, but sadly his Mom threw it out while he was on his honeymoon. Getting back to the gang name, here is an example of a newspaper not getting all their facts straight. 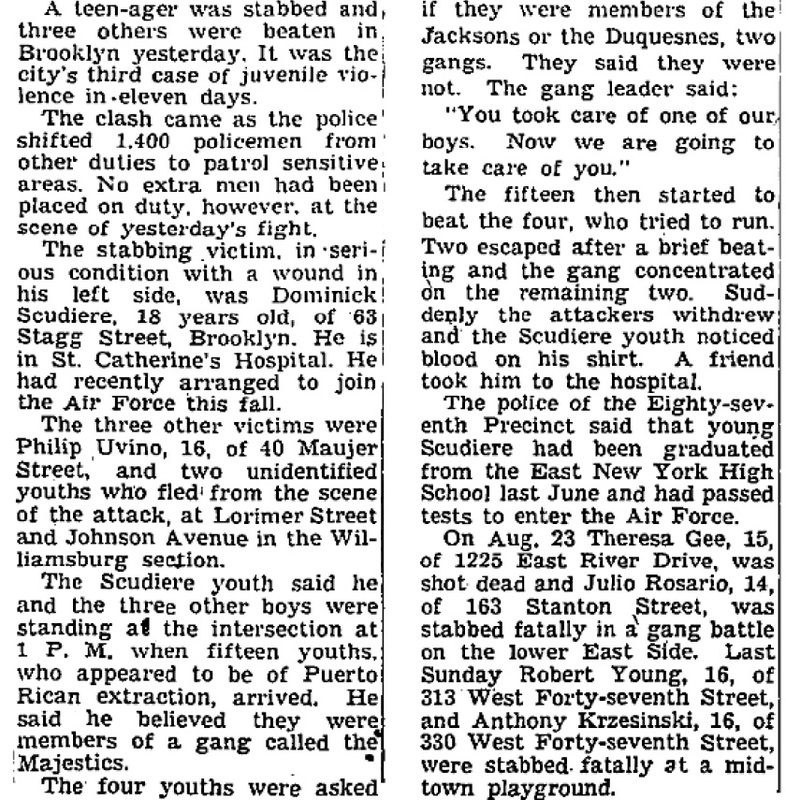 In a September 3, 1959 article (see below), the New York Times reported about a gang called the “Duquesnes,” who were beaten and stabbed by a Puerto Rican gang in Williamsburg. The name “Duquesne” sounded similar to “Dukane,” and seeing it happened in Williamsburg, I sent it to Doc to take a look at. He told me he knew what had happened that day; the New York Times reported the name Dukane incorrectly, besides which point by that time they were the Jackson Gents. According to Doc, the guys who were beaten and stabbed weren’t in the Jackson Gents but were known in the neighborhood. Wolfman was beaten to death, his body discovered in an apartment in Brooklyn, while Rocky went into construction. Doc became a partner in a Wall Street firm, Crazy Junior went to jail, never to be seen again and Z-man became a cop. Another member, Andrew “Bo” Whalen was knifed twice in the back and killed in a gang fight in December 1960. BOYS she called us, she was looking down on a bunch of guys in their 50’s. Four members of the Jackson Gents, circa 1959. From left to right is Mikey Dee, Mikey Blind, T and Doc. Photo provided courtesy of Doc.